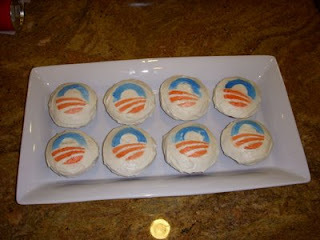 My wife got a little creative on me yesterday and made these Obama cupcakes. For a rush job, I think they turned out quite alright and they tasted great. They're red velvet cupcakes with food coloring sprayed on to create the logo. Sweet! Is that artificial color? Those would've sold well here in Chicago. you think you could e-mail me one?